Orion Solar has been supplying and supporting solar powered lighting solutions throughout Australia since 2004. We source the best available solar power technology, along with the best in LED luminaires to provide Australia’s most advanced solutions in solar powered area lighting. In addition to having some of the best suppliers in the world we have developed some enhancements of our own to offer solar powered public area lighting solutions for every need. In 2004 Orion became the Australian distributor for Carmanah Technologies Inc of Canada, the market leaders in the manufacture of solar powered LED lighting for the marine and aviation industries. Orion has gone on to supply Carmanah products to marine authorities and airports in every State of Australia. Our solar powered obstruction and hazard warning lights have also been widely accepted by mining companies in many remote parts of Australia and our solar powered area lighting is a major enhancement to many aspects of mine safety. Orion has added additional LED safety lighting products to meet various applications throughout all markets. Carmanah offers the world's only solar-powered LED aviation lights for airport and obstruction lighting at commercial airports, air force bases, general aviation airports and obstruction landmarks. Carmanah's aviation lights are completely self-contained, install in minutes, operate reliably under the harshest environmental conditions and require no maintenance, servicing or power costs for their entire five-year life span. They are ideal for both permanent and temporary airport and obstruction lighting. 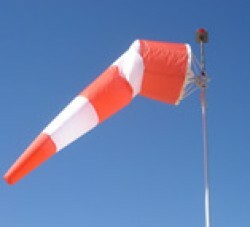 An essential airfield and helipad accessory, windsocks are required to be lit on every airfield and helipad worldwide. Used to help pilots better determine wind direction from a greater distance, windsocks increase the safety of landings at night and in low-visibility conditions. The world's most advanced solar-powered LED lighting solution for marking all types of obstructions. As the latest generation in Carmanah's line of aviation lighting fixtures, which offer a range of new features and capabilities for all types of obstruction applications. The A650 is a self-contained, high-performance, low-maintenance and easy-to-install solar-powered light source for aviation and industrial environments. applications include: taxiway edge lighting; apron edge lighting; emergency airfield and helipad lighting; construction barricade lighting on airfields; and obstruction lighting. State-of-the-art 3 mile aviation light with robust design and high performance output. Battery pack is available to extend life beyond 5 years. Extended body houses large solar panels and battery system. 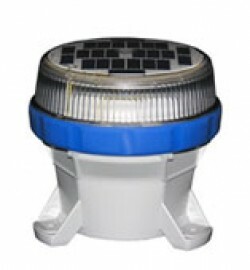 Designed for reliable operation at high latitudes and in areas of low solar illumination. The efficient OB-810 light fitting is easily retrofittable to existing L810 fixtures. With optimised light output and reduced power consumption, the robust OB-810 will operate reliably for years. The integrated heatsink technology further extends the operating life of the unit.